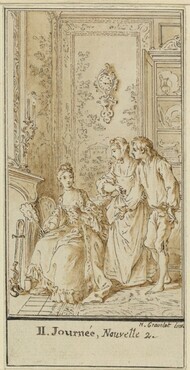 inscribed by Gravelot in pen and gray ink over traces of red chalk below the image: F.Boucher inv; and at lower center: II. Journée, Nouvelle 7. Renaissance to Revolution: French Drawings from the National Gallery of Art, 1500-1800. National Gallery of Art, Washington, 2009, 146-149, 284, no. 63d (color). Portalis, Baron Roger de. Les dessinateurs d'illustrations au 18e siècle. 2 parts in 4 vols. Paris, 1877, 1 (pt. 2): 276, 291 (the set). Goncourt, Edmond and Jules de. L'Art du XVIIIe siècle. 2 vols. Paris, 1880-1882, 2: 41, 132 (the set). Cohen, Henri. Guide de l'amateur de livres à gravures de XVIIIe siècle. 6th ed., rev. and augmented by Seymour de Ricci. Paris, 1912: col. 160 (the set). Lugt, Frits. Les marques de collections de dessins & d'estampes; marques estampillées et écrites de collections. Amsterdam, 1921: 175, under no. 996 (sale of 1870) (the set). Ricci, Seymour de. A Checklist of the More Important French Illustrated Books of the Eighteenth Century. Philadelphia, 1923:  (the set). Ricci, Seymour de. The Roederer Library of French Books, Prints, and Drawings of the 18th Century. Philadelphia, 1923: [4-7] (the set). Ananoff, Alexandre, with Daniel Wildenstein. François Boucher. 2 vols. Lausanne and Paris, 1976: 1:83, fig. 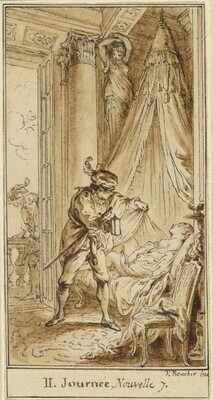 121 (as François Boucher).